Burke Moser runs away from pressure as he finds an open receiver. Playing on the road, the Maroons took a plane ride down to MountBerry, GA to play conference rivals Berry College. Going into this match, the South Siders were on even standing with the Berry Vikings in the conference. This was a game to see who would best the other, and for a chance to jump up in the stands. With only two away games left for Chicago, the team was in need of big wins on the road if they wanted to keep their season alive. The first half saw an incredible effort from the Maroons as the defense stood firm against a powerful Berry offense. On the other side of the ball, the Vikings were unable to stop the Chicago passing game as fourth-year quarterback Burke Moser found third-year running back Chandler Carroll for a 10-yard touchdown pass at the end of the first quarter. The team didn’t stop there either, as they came back in the second quarter with a 79-yard drive that culminated with Carroll diving into the end zone from one yard out to secure a 14–0 lead for the Maroons heading into the half. However, the Maroons were unable to hold the lead in the second half as Berry came out firing. The team started out the quarter with a 64-yard drive that was capped off by a 20-yard touchdown run by Berry quarterback Slade Dale. The Vikings evened things up just moments later when they picked up a Chicago fumble and ran it into the end zone. The game remained tied until the fourth quarter, when Berry broke through with a one-yard touchdown run of its own. However, Chicago answered back just two minutes later when Moser connected with second-year quarterback/receiver Trevor Anderson from 15 yards out to even the score. Moser had a career day Saturday, passing for 383 yards, which set a school record. However, the valiant effort just wasn’t enough as Berry drove back down the field and scored just two minutes later, taking a 28–21 lead. While the Maroons tried twice to march back down the field, the Vikings defense held on for the win. “Berry was a tough game for us,” Anderson said. He had three receptions for 45 yards on the day. “We fought hard but it just got away from us late. We need to improve through hard work at practice this week. This is the most important week of the year. The team feels that we’ll be ready for Rhodes and hungry for a win, especially after a close game like this. We really want to be able to get the win for homecoming,” said the second-year. 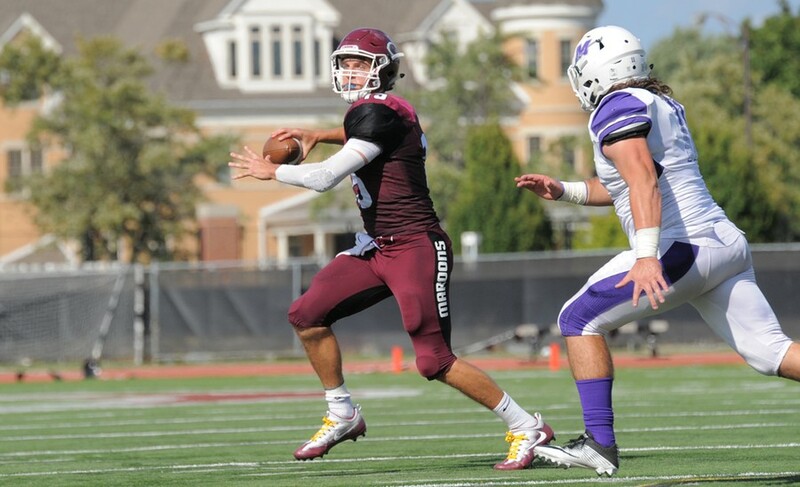 The Maroons take on the Rhodes Lynx on Saturday, October 15 at Stagg Field. The game is homecoming and is expected to have the highest attendance of the year. Kickoff is scheduled for 1:30 p.m.